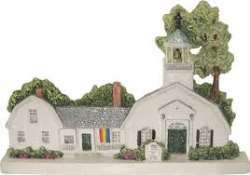 Marblehead classes are on Mondays, Tuesdays, Wednesdays & Fridays. If coming from Pleasant Street (route 114), go all the way to the end. (Old Town Hall), which is an island. Turn left right after this building and continue up the hill onto Mugford Street. The church is on your left hand side. You may park in the street right in front of the church. there is, usually, plenty of parking space available.